Until this past week I had remained hopeful that that the United Methodist Church might be able to find the “Middle Way”–the way that allows “both/and” to be a part of who we are so that we could love one another as Jesus loved and be “one in the Spirit.” I am now convinced that this is not possible when it comes to the issue of sexual identity. Yes, I am now only going to discuss sexual identity to truthfully name and frame the issue before the United Methodist Church. With God’s grace and the power of the Holy Spirit within us, let us realize that sexual identity is not a politically laden topic with only one “right” way of thinking. With God’s grace and the power of the Holy Spirit within us, might it be possible for us to recognize that our own faith life experiences and religious doctrines along with the ways the media presents this mislabeled issue with visual and stereotypical images have contributed to people on both sides digging in their heels and refusing to budge because we are convinced that we are “the correct ones”–the ones who are holding up the “truth and orthodoxy” of the church? I have long ago given up that I will ever convince or persuade anyone who does not agree with me on the issue of sexual identity. God loves all people and God calls all people into ministry to make disciples of Christ to transform the world and sent Jesus the Christ to redeem and reconcile us to God. If the “right/orthodox” ways of the culture and context of the Bible in the laws of the Old Testament and in some of the writings of Paul (along with those attributed to Paul) are upheld in the context and culture of the 21st century, then I would not be an ordained clergy woman in the United Methodist Church. Let me also fully confess that I am in a second marriage of 25 years, and that would be an additional strike against my ordination as clergy. I would also still be clinging to the “right/orthodox” heritage from my great-grandfather, who was the largest slave owner in Carroll County, Georgia, and justifying that once accepted life style as something to continue to replicate. With God’s help I have managed to leave what many of my Southern Baptist Sunday school teachers and clergy, along with my parents and other relatives taught me about race, sexual identity and my place as a woman in this world and claimed my citizenship in God’s Kingdom. I am certain that God’s grace in the life, ministry, death and resurrection of Jesus means sexual identity is not something that God would have the church of Christ spend so much time arguing and conducting trials of people who are called to ordained ministry. Peter and Paul had their differences on food and circumcision, and they each continued in their calling and ministry to follow Jesus. Can we as United Methodists agree that sexual identity is not an issue we can agree on or will we ever be able to give a definitive answer on this issue because it was never an issue that Jesus addressed? There are a multitude of issues Jesus never addressed, and we manage to act on those and move on–polygamy, slavery and ordaining women–to name only a few issues. Oh wait, the Methodist Episcopal Church did split over the issue of slavery; and it reunited later. Where once I had hoped and prayed that this split of the United Methodist Church would never happen over sexual identity, I am now convinced that it will happen if we are ever going to move on and be able to be the church of Christ. Maybe in the future we will unite again. The truth is we are now and have been, since we allowed the issue of sexual identity to enter into our Book of Discipline, a divided church of Christ. Paul knew clearly that a divided body cannot function healthfully, cannot thrive, and cannot be the body of Christ. The United Methodist Church is a divided body over the issue of sexual identity. The majority of our bishops are more interested in upholding doctrine and orthodoxy than they are interested in being united in Jesus the Christ. Lord have mercy on us all. May the grace of God and the redemption and reconciliation of Jesus the Christ overcome this travesty that we have created. Photograph I took of the Westerkurk, one the first built Protestant churches (1620-1630)–located close to the Achterhuis (now Anne Frank House) where diarist Anne Frank, her family and others hid from Nazi persecution for two years during World War II. 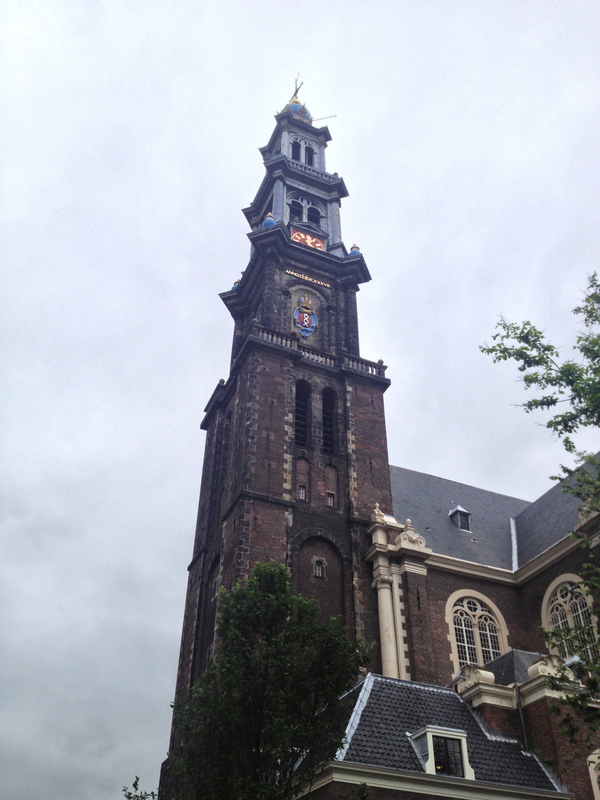 The Westerkerk is mentioned frequently in her diary – its clock tower could be seen from the attic of the Achterhuis and Anne Frank described the chiming of the clock as a source of comfort. Rembrandt is also buried here. I think it is an appropriate image for this blog post. A Way Forward for the UMC: A Response to "A Time to Split?" by Amy Frykholm in "The Christian Century"